The time has come to close up shop at Booze Movies, as I've opened a new store front, It Came From the Bottom Shelf! The new site (found at www.bottomshelfmovies.com) is a movie recommendation site, focusing on forgotten classics, lesser-known gems, and oddball discoveries. In the Bottom Shelf, I will try to shine a spotlight on titles that haven’t received the level of attention they deserve. In that endeavor, I will post capsule movie reviews, “Pick of the Week” video releases, upcoming DVD announcements, sales alerts, and other cinematic news. 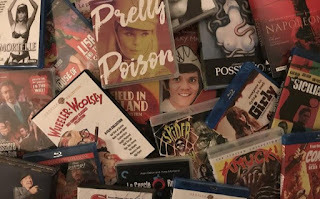 My hope is that this site will eventually become a reference for video collectors and binge-watchers who think they’ve seen everything — sort of an electronic equivalent of Danny Peary’s Guide for the Film Fanatic or Michael Weldon’s The Psychotronic Encyclopedia of Film (although likely nowhere near as good). So this isn't "goodbye." It's "come visit me at my new address, when you're in the neighborhood." I hope you like my new digs. P.S. -- Boozemovies.com will not disappear anytime in the near future. I'll leave it up as a reference for myself and others.